1. A small lump of gold or other precious metal found in the earth. 2. A small lump of another substance: "tiny nuggets of shrimp". So...yeah. Small Lumps of Catfish. Small Clods of Catfish. Either one of those titles could describe these. But I'm sticking with 'nuggets'. It sounds so much more appetizing, wouldn't you say? Basically, I can buy what is labeled as catfish nuggets from the fish counter at my local market right next to the catfish fillets. Nuggets are $2.99/lb. and fillets are $6.99/lb. So if I'm planning on cutting the fish down anyway, I may as well go frugal! My oldes has been asking for catfish (his favorite type of fish) again for the longest time now. But I've mentioned my pickiness when it comes to fish and seafood before, and until now, I hadn't found any that looked fresh enough. Fortunately when I went shopping the other day, I found some beautiful, white, firm fillets (and nuggets) on display. Winner, winner, catfish dinner! 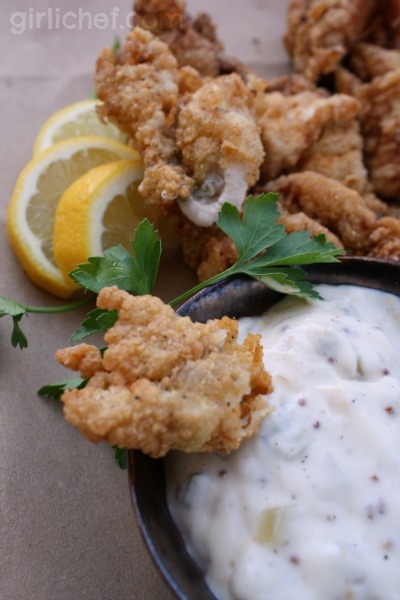 Alongside a salad, maybe some crusty bread or veggies, a few lemon slices, and an equally quick homemade tartar sauce, this makes for a quick and delicious weeknight meal! Just remember to marinate your catfish the night before. Once you've pulled it out of the fridge and allowed it to drain, your coating will be mixed and your oil will be hot. Dinner will be on the table in 30 minutes! 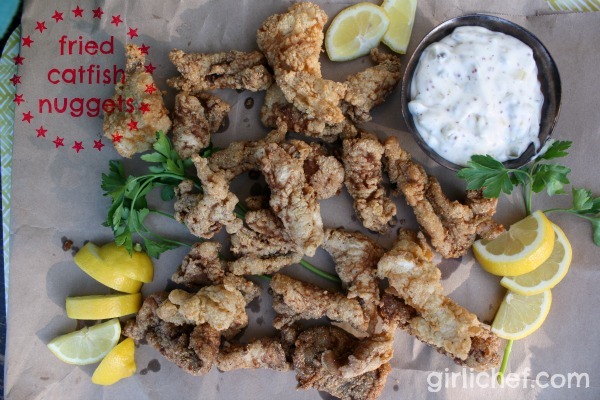 Place the catfish nuggets into a large bowl, dish, or heavy-duty baggie. Pour the buttermilk over it, and then shake in as many dashes of Tabasco as you wish (more if you like it spicier, just a few if you want it just faintly flavored). Use your hands to move everything around and coat the fish well. Seal/cover well and refrigerate for at least 8 hours, or up to 24. Remove the fish from the fridge, and pour into a large colander set over the sink. Allow to sit and drain and room temperature for 10-15 minutes. In the meantime, combine cornmeal, masa harina, flour, salt, pepper, cayenne, and garlic salt in a gallon-size baggie (or a large dish). Pour oil to a depth of about 2-inches into a large, deep cast-iron (or other heavy) skillet; attach an oil thermometer and heat to 360° F. Line a baking sheet with paper towels and top them with a wire rack. Set aside. 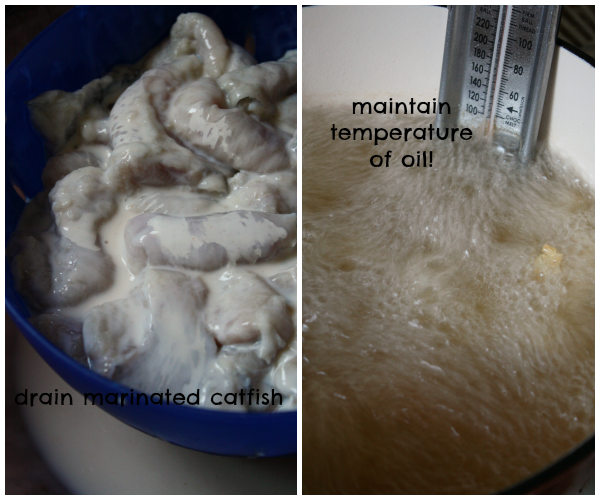 When the oil is ready, add a handful of the drained catfish nuggets to the dry mixture. Either seal the baggie and shake it around to coat, or toss them in the bowl, using your hands. Whichever way you choose, just be sure that each piece is well-coated. Carefully lower the fish, one piece at a time, into the hot oil. Take care not to crowd the pan. Fry for approximately 4 minutes total, or until the fish looks brown and floats to the top of the oil. Carefully remove the the oil using a fish spatula, skimmer, or other flat, slotted metal utensil. Set on the prepared rack. Allow oil to come back up to temperature, and repeat with remaining fish, until all of the fish is cooked. If you like, you can keep the tray of already fried fish in a low oven (225° F) until all the pieces are ready. 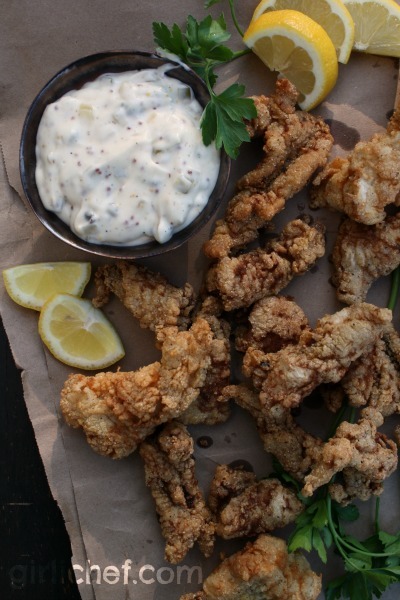 Serve immediately with lemon slices and tartar sauce. Great with a cold beer, too. Whisk all of the ingredients together with a fork. Use soon, or store, covered, in the fridge for a few days, if you wish. This dredge can be used on whole catfish fillets, as well. I don't recommend frying more than about 2 pounds of nuggets in one batch of oil, because it turns dark very quickly. I like my tartar sauce chunky, but if you prefer it a bit smoother, you can pulse everything in a mini food processor until well mixed and slightly smooth, but not entirely pureed. Catfish adapted from Southern Living July 2010. Tartar Sauce adapted from Ina Garten.